If you’re travelling solo and fancy a cruise on the Ocean Spray, here’s a tip: if you go for the one single cabin that’s available at less cost, bring ear-plugs. It’s right next to the bridge and it’s noisy. It’s also dark and poky. Of course, you’re only in there to sleep, so that’s not so important – but it’s definitely a shame that you can hear the captain on his radio, the loud hum of some sort of equipment, talking and doors opening and closing in the middle of the night. After two nights of this I suggested that it might be sensible to give me the sort of experience that everyone else has been getting, so I am now ensconced in a big, airy stateroom with a generous bathroom and it’s just lovely. If you come, and you should, don’t stint on the accommodation if you can. Enough complaining: today has been classic Galapagos. Before breakfast, agile little Elliot’s petrels were walking on the glossy water behind the boat; then, on a cruise around the bay before landing, we got photos of a stately great blue heron, playful sea lion and multiple Sally Lightfoot crabs in the one shot, and then saw red and black iguanas basking in the sun on the black basalt. I got a bit excited at catching a turtle’s head out of the water – but soon realised I could do much better once we were in the water with our snorkels. Turtles? Everywhere! Resting on the bottom, grazing on algae growing on the rocks, and cruising up to the surface to breathe: green turtles, hanging around waiting till nightfall to come ashore to lay their eggs under the full moon, and totally unmoved by our presence, no matter how close we got to them. All this, plus a ray and playful sea lions. After lunch, we got kitted out again for our first deep-sea snorkel, at Devil’s Crown, a broken circle of jagged basalt rocks that are all that remains of a volcanic crater. The snorkelling was brilliant! There were so many varieties of fish, in big schools or single, grazing the rocks or swirling through the water – big, small, colourful, sombre. Plus starfish, all sorts, a white-tipped reef shark, a jauntily-striped moray eel sliding over the rocks, and more sea lions swooping and twisting around us – all in clear, turquoise water. It was a touch chilly, so after an hour of circling the rocks and investigating the reef in the middle, we were ready for a wallow in the hot Jacuzzi on the top deck back on the boat. Then it was out again, this time to walk across Floreana to a beach where the low sun spotlit the birds, crabs and distant islands, and we found the nest of a turtle, freshly dug last night and surrounded by tractor-track marks where she had dragged herself back to the water after laying her 100 or so eggs. 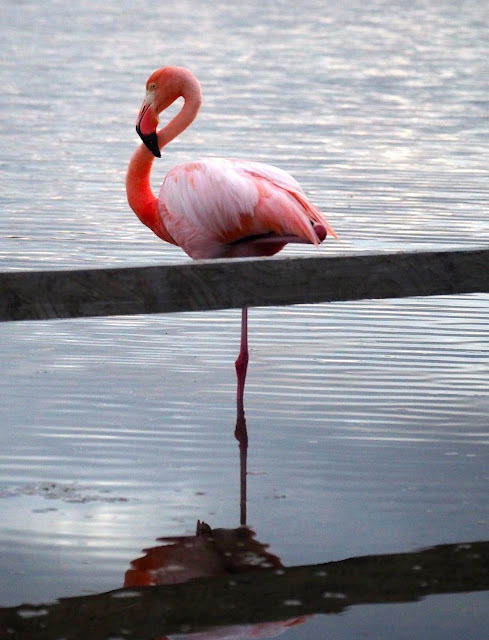 Finally, there was a lagoon with half-a-dozen bright pink flamingos standing on one leg busily preening – the default activity for all birds here, vain things. After a showing a video of the last few days that he’d filmed, naturalist/guide Morris summarised for us everything that we’d seen and done, and though it had been less than three days, it was an impressive list. Those staying on board for the full week – or better still, two like Reuben and his mother – will have a truly comprehensive resumé by the time they finish. We ended the day with a barbecue dinner on the open deck, fish and squid and shrimp from local waters, already sorry that tomorrow we would be leaving.